We are in constant symbiosis with the 100 trillion microbes in our gut and the complex system of bacteria around us in our environment. Within the field of metagenomics, it clear that understanding the built environment is necessary in order to learn more about ourselves as participants in this microbial ecosystem. By understanding the cities which we inhabit in from a bacterial point of view we can begin to discern the invisible qualities of cities. I want to understand the city as a biological organism, understand its bacterial ecosystem and visualize the invisible microbial world within the built environment. I propose a method of sampling biological material from cities by using honeybees (Apis mellifera) as a proxy to swab-based sampling methods. Team: Kevin Slavin and Miguel Perez (Playful Systems Group at the MIT Media Lab), Dr. Elizabeth Henaff and Dr. Chris Mason (Mason Lab at Weil Cornel), Devora Najjar (The Cooper Union), Benjamin Berman (MIT), Chris Woebken (Extrapolation Factory), Regina Flores Mir (Parsons School of Design), local beekeepers in Tokyo, Venice, Melbourne, Sydney, Chicago, Brooklyn and Queens. We are at the dawn of an era where genetic sequencing is affordable. The Human Genome Project brought advances in biomedicine and brought us closer to understanding the human makeup from a functional standpoint. Understanding the microbial environment which we interact with is the next step before we can begin to ask fundamental questions about life and the invisible microbial world. In order to see it, you must sense it first. The initial ideas proposed by the Earth Microbiome Project resonate through many research institutions worldwide. The effort to sample cities at large scale is present, but the methods used for sampling have not changed since a long time. The process continues to be tedious, depends on the presence of researchers, represents very little surface area per sample, and the results could be biased based on the person who collects the sample. I propose that we shift our methods for collecting DNA from manual into semi-autonomous, taking advantage of existing systems in cities which we can leverage for collecting DNA. 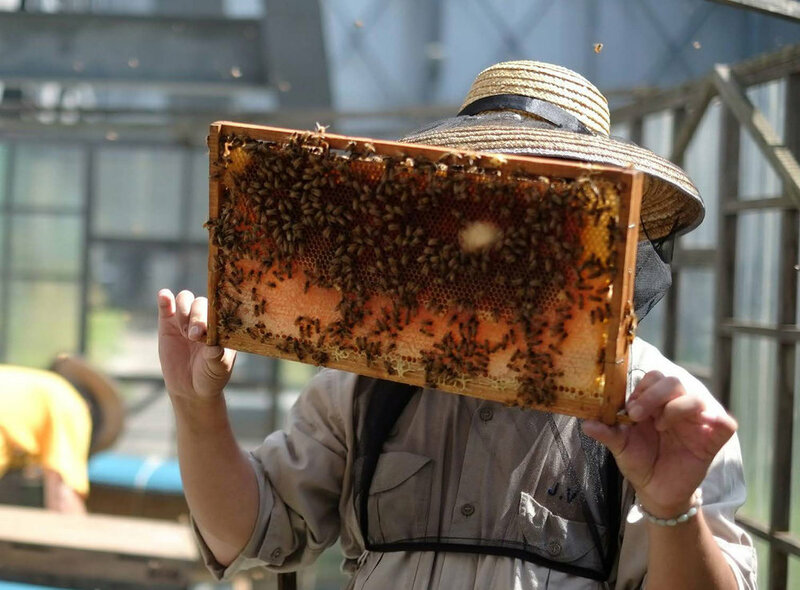 Beekeeping is very popular among the largest and densest cities in the world, opening the possibility for us to take advantage of their innate behavior as a sensor. There are 10,000-80,000 bees per colony, with 50-80% of them foraging their local environment up 3-5 miles in radius. I hypothesize that their air travel permits them to interact with indicators of various microbial environments besides just the pollen they are seeking to bring back to their hive. By comparing the microbial environment between hives we can discern that the differences are local to their 3-5 mile radius, effectively creating nodes which represent the geo-spatial microbial environments. Using bees as a method for microbial sampling can provide us with high frequency results and bring us closer to understanding the invisible world of microbes in cities without having to send teams of researchers out into the field. We are experiencing a shift in perception about the presence of microbes in our lives. Efforts have been made in the last six years to discover the invisible world of microbes particularly in cities. Sampling tools, however have not been explored in the context of sensing microbial environments in dynamic states. The scientific contribution of this proposal is to explore new methods for sampling environmental microbes at high frequencies with low human involvement by using bees as sensors. This new interspecies dependency begins to hint at a world of “directed symbiosis”.